Today we embarked on a fun and messy project. Full disclosure, you probably don't want to start this one right before dinner or you'll all be eating crayon sprinkles as they seem to get everywhere. And if you think I am Maria Vontrapp and we make these kinds of projects everyday, we don't. This is more like making up for all the projects we don't make every day. Ha. You can definitely include your kids, as I have with this one. But there is no shame in a grown woman grating crayons and making her own wreath. Happy melting! Reject crayons. We used broke old ones. A ribbon or something similar to hang it! 1. Locate reject crayons. Peel the papers off. 2. 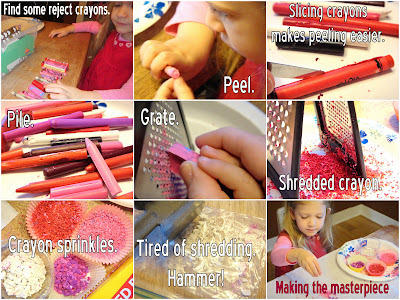 Grate crayons or hammer in a bag. 3. Lay an OLD towel you don't care about or a piece of cardboard down and lay a piece of wax paper on top. 4. 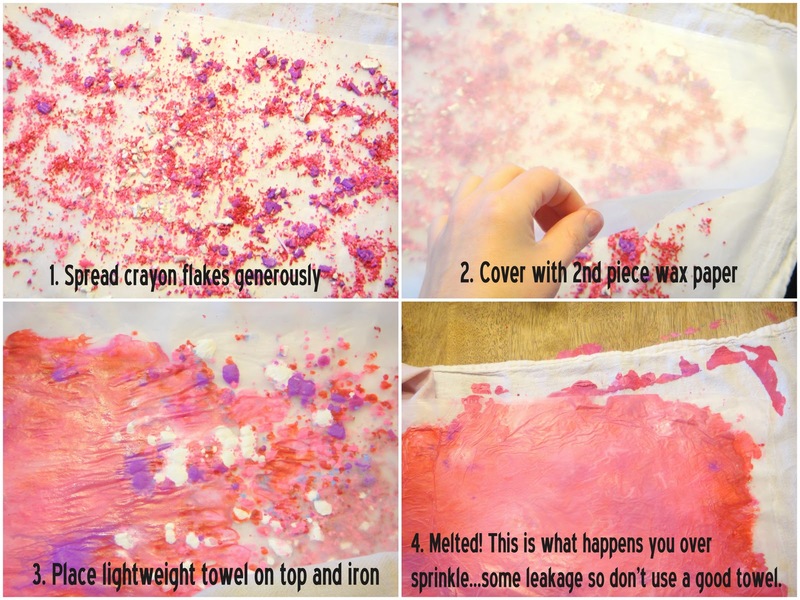 Sprinkle crayons over wax paper. 5. 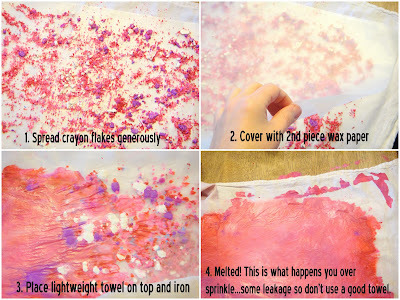 Now layer a second sheet of wax paper on top and lay a thin OLD towel or something similar on top and iron until crayon flakes have melted. 7. Make a small heart template out of cardstock/cardboard/recycling. And make a circle template for the wreath out of similar material. I traced one of my plates. Then cut a circle inside the circle, so it looks like a donut. 8. Cut strips of the wax paper and layer them and cut out hearts. 9. Use tape or glue and place the hearts around your circular/donut shaped wreath template until covered. 10. Tie a ribbon and hang or gift away! Notes: I sliced the crayons which made peeling them much easier for Isla. We started with the grater (I let her help me) then ended up going with the mallet as the crayon sprinkles were getting everywhere and sticking to everything. You also don't need as many sprinkles as you might thing. I think we actually used too many which made it leak out the sides onto my towel and table. Yeah! A little goes a long way. Create a template and cut out hearts. 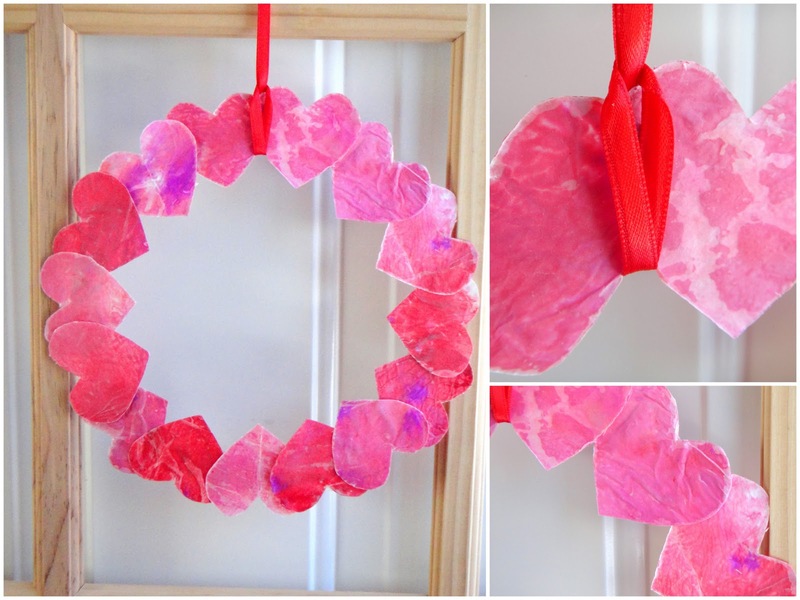 Cover your wreath template with the hearts using glue or tape. I just might be one of those moms who makes this alone. Hhaha. Haha. Hey stranger :) I love that I just sent this to you on pinterest and you commented. Let's do it together minus kiddos. My Mini Kitchen Make Over. Long overdue.